Mountain pose is the foundation of our practice. We need strong roots to be tall. It’s not just a metaphor, the action of learning to root our feet into the pool floor teaches us to maintain good posture, improve our balance, and know where our body is in space. Shoulder retraction is something most of us need these days since we spend a lot of time hunched over devices. This video shows how to use a kickboard to get some opening across your chest, while still keeping grounded. Walking backwards in the pool is a great place to get dynamic hip extension. Adding that diagonal arm movement is a huge coordination challenge. Everyone gets a kick out of the fact by about four steps, they’ve unknowingly transitioned back into a same side movement. Half Moon Pose is no longer an option for so many people in land classes. In the water it’s a beautiful opportunity to be big, take up space, and sparkle like the moon it’s named after. Here’s a version with a kickboard for some support. Enjoy using this month’s aqua yoga tips! 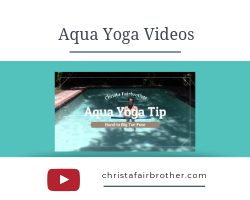 Last month’s aqua yoga tips can be found HERE and look for the March tips next month.